Providing hot water systems to both households and commercial businesses for more than 60 years, Bosch is a big player in both the Australian and international markets. Bosch has a lot of fingers in a lot of pies, allowing the company to use new technology across a multitude of industries, with its hot water sector no exception. As a result, Bosch is often the trailblazer for hot water technology, with consumers reaping the benefits of the company’s innovation. Find out what Bosch has to offer in this Canstar Blue review. The biggest range within its arsenal, Bosch’s gas hot water systems are some of the best around in terms of energy efficiency, meaning that you’ll be saving money long into the future. 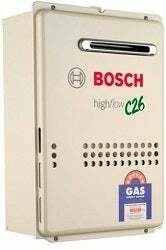 With a minimum 2-year warranty on all models for parts and labour, including 10 years warranty on the heat exchanger, Bosch also seems to be heavily focused on providing good customer service. Being a big industrial company, Bosch knows its way around new technology, evident in its OptiFlow system range. With each model in the range carrying a 6 star energy efficiency rating, as well as solar compatibilities, you can’t doubt Bosch’s capabilities and vision. In this line of models, Bosch has also produced an industry first, including Bluetooth connectivity within its Premium Model OptiFlow. That’s pretty fancy stuff for a hot water system, but in a day and age when technology influences virtually every sector, why not have a Bluetooth capable hot water system? If the Bluetooth is a bit too much for your humble water needs, Bosch has plenty of other options, including its Mechanical and Condensing range, detailed below. Bosch’s Mechanical hot water system range includes three models – the Pilot Ignition, the Internal Compact and the Hydropower, seemingly covering all bases for consumer needs. Each capable of heating one or two bathrooms depending on the model, the Mechanical range should suit most households. 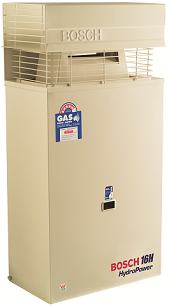 Built for the masses, the Mechanical models would adequately suit the average household, with enough power to give you peace of mind, while efficient enough to make an impact on your next bill. If you’re after something that takes efficiency to the next level, check out Bosch’s Condensing Range, with models that don’t fall below a 6 star rating. Utilising a second condensing heat exchanger, the condensing range allows for continuous water flow performance, saving consumers up to 12% compared to non-condensing models, Bosch says. Additionally, the condensing models also come with a range of controllers and accessories, meaning that consumers can really be in charge of their systems. With the Tronic 1000T model, Bosch claims to offer consumers a reliable and solid system. Covered in vitreous enamel for durability in most environments, the Tronic comes in a wide variety of sizes and dimensions to suit households of all sizes. With the range provided, Bosch has a model to suit single person households, all the way through to large families. If you’re looking for something with a bit more grunt to it, then Bosch has you covered with its Commercial series. 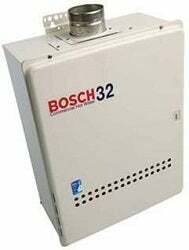 Suitable for households of three or more bathrooms, the Bosch 32 Series has a 4.8 energy star rating, giving you consistency in water flow and energy consumption. Because of its wide variety of business ventures, Bosch offers more than simple hot water systems, with products like heat pumps also available. Heat pumps work the opposite to how a fridge works, in that instead of expelling the heat, the pump expels the cool air to ensure the water within the pump is kept warm, despite what the temperature outside the unit. While the cost is a bit hard to swallow, even with the rebate, Bosch claims that this model uses 65% less energy than conventional electric storage systems, meaning that you’ll save money quickly in the future due to less expensive energy bills. 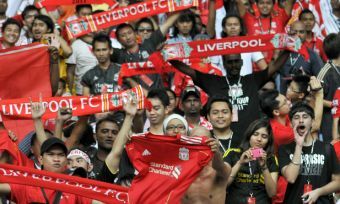 So if you have the initial payment ready, it may well be worth it. 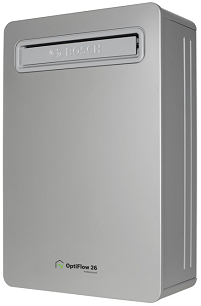 Is a Bosch hot water system worth the money? If you’re all about energy efficiency and having the latest and greatest products, Bosch would be right up your alley. With a rich history, expertise in multiple industries and an apparent drive to produce the best hot water systems for a range of consumers, Bosch clearly keeps its end users in mind when designing products. But with any purchase, it has to fit in with your individual needs. Location, water quality and consumption will all be factors in which product and brand you ultimate choose, but Bosch’s range and quality of products makes it hard to ignore, regardless of what type of model you’re looking for. Add it to your consideration list.